Everything you need to know about how to buying Spanish property and moving to Spain - safely! 'How to Buy Spanish Property and Move to Spain - Safely' (2014) has 325 pages, 80,000 words, 26 sections, appendix with over 160 Spanish words and definitions and section with Useful Contacts. Written by professional author with 9 expert contributors. 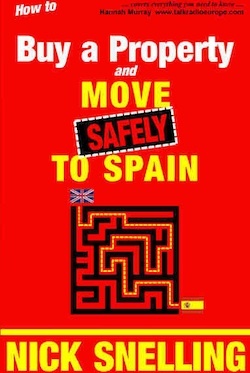 'How to Buy Spanish Property and Move to Spain - Safely' (updated 2014) has 80,000 words, 325 pages and 26 sections. It also has over 160 vital Spanish Terms and Definitions and an invaluable appendix with Useful Contacts. 9 highly qualified, professional contributors (Spanish and British) have provided their expert advice and these contributors have ranged from a doctor and vet through to property specialists, a lawyer, accountant and building surveyor. The book has been written by a Spanish industry 'insider' and professional author (Nick Snelling) who has written four books about Spain and numerous articles. He also runs www.culturespain.com which is a highly regarded authority information site about Spain.